St. Louis civic and business leaders on Tuesday announced plans to form a bid to attract a Major League Soccer expansion team in St. Louis. Carolyn Kindle Betz, Enterprise senior vice president and executive director of the Enterprise Holding Foundation, and also a granddaughter of company founder Jack Taylor, leads the ownership group with six other female members of the Taylor family. If the bid is successful, St. Louis would host the first majority female-owned MLS club and one of only a handful of female-owned franchises in all of professional sports. “The combination of our two families, the Taylors and the Kavanaughs, merge a love for St. Louis, a love for soccer, and we view an MLS team as a lasting legacy to the city we love,” Betz said at a new conference to announce the bid on Tuesday. Betz said the 100 percent St. Louis-based ownership team would be sending a strong message to MLS about their commitment to joining the professional soccer league. “We’re going to focus all of our efforts on showing them that St. Louis is indeed the best city for a club, and that we want the club, and we can a support club," she said. “We look forward to spending time with them during the coming months to learn more about their plan,” Courtemanche said. 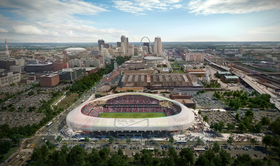 Last year, St. Louis voters rejected a proposition that would have directed $60 million in public funding toward building a professional soccer stadium, which effectively sunk St. Louis’ bid to be awarded an MLS expansion team. The stadium being proposed would be “heavily privately financed,” according to the project website. The group is looking at building the stadium just west of Union Station in downtown — the same land that was included in the failed 2017 proposal. The ownership group’s new proposal doesn’t call for funding from the city, so the public will not vote on the stadium. However, the group said it does plan to request a tax break on the city’s 5 percent ticket tax, charged for sporting events. St. Louis aldermen would have to approve such a deal. St. Louis Mayor Lyda Krewson called the proposal great for fans, Major League Soccer and for the city. “St. Louis is a soccer town. We play it, we watch it, now let’s score a franchise,” she told the crowd. The group will also request tax credits from the state. The ownership group is forming a bid to present to the MLS. It does not have a timeline for the work.